The Tampa Police Department is getting ready for PRIDE this weekend and they want to make sure people are safe. TAMPA, Fla. — The Tampa Police Department is getting ready for PRIDE this weekend and they want to make sure people are safe. They say their biggest concern is traffic, but that won't be the only think they pay attention to. TPD Detective Robin Polk says officers will also be paying attention to reports of hate crimes. Detective Polk says they work hard to combat hate crimes in the city. They have a program called the Safe Place Program, which started about a year and a half ago. There are more than 100 businesses that are participating in the program. Those businesses are considered a safe haven. People can tell which businesses are participating because they have a sticker posted up front. “They basically just offer safe haven for victims to go there and call the police,” Detective Polk said. The Life Center of the Suncoast is one of the businesses participating in the program. They provide grief and trauma counseling to people in Tampa. “It made a lot of sense to do this extra little bit of training to be able to take care of folks and be a safe place they can come to, to be able to report a crime,” Brittany Hundley said. Hundley is the community outreach director of the Life Center of the Suncoast. She said they have been part of the program since nearly the beginning. “So the sticker being on the window, I hope adds an extra level of safety and trust that we’re going to be supportive,” Hundley said. According to Detective Polk, hate crimes have declined in Tampa. She says that type of crime is fairly low for a city the size of Tampa. Since 2016, two to five crimes have been reported. She said regardless, they want to send a clear message by having the program in place in the city. 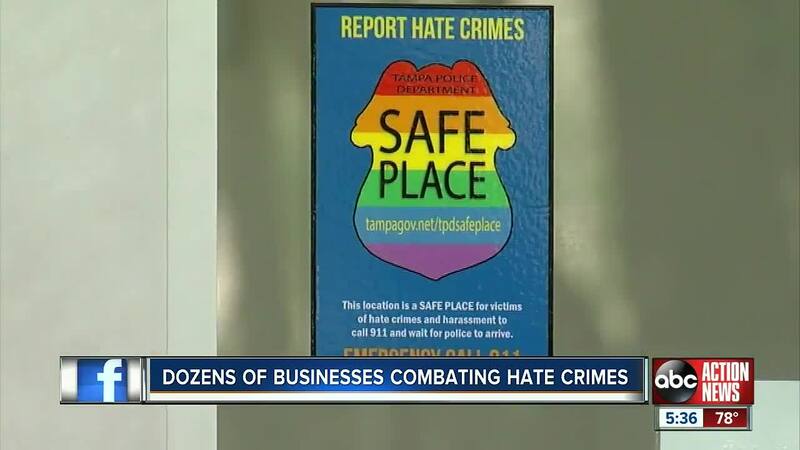 “Seeing these stickers on these businesses literally sends a message to both the people who would be committing the crimes and the victim’s of the crime that this is just not the city that we live in. We don’t tolerate -whether it’s harassment or crime or whatever,” she said.